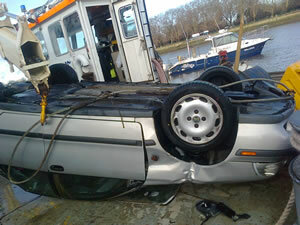 PLA Recovered Volvo Sunk Off Putney Embankment! When a member of the public reported a silver volvo floating into the Thames last week ( 18th January)the RNLI, Fire teams and the PLA were called out. The car had sunk without trace, creating a potential navigational hazard to boats and a potential risk to river users in the Putney area. The Port of London Authority (PLA) sent its hydrographic survey boat 'Galloper' to the scene early the next day. 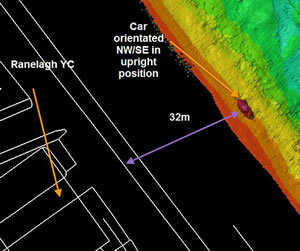 'Galloper' is fitted with advanced sonar equipment and she successfully located the sunken car on the riverbed - see the red blob in the sonar image. Having located the car the PLA then sent the vessel 'Driftwood 2' to the scene. This vessel is fitted with a crane and she lifted the car from the river bed.